When you’re scoping out a new MIDI controller, it’s easy to be seduced by the number of knobs, pads, faders and - let’s face it - blinking lights that are sitting on its surface. But while having a wide range of controls is great, they’re not much use if you have to spend time getting them mapped to your favourite plugins. Fortunately, Nektar’s new Panorama T-Series controllers make setup headaches and compatibility problems a thing of the past. They offer Deep Instrument Control in any VST/AU-supporting DAW, meaning that you’ll always be in charge of your favourite music production software. 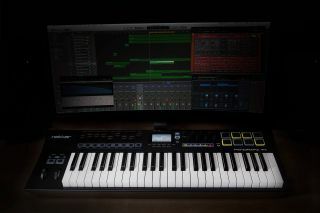 The T4 and T6 controllers have 49- and 61-note aftertouch keyboards respectively, but whichever model you choose, the level of software integration is the same. Let’s start by talking about the MCU compatibility, which gives you a basic level of control in pretty much any DAW for features such as transport functions and track levels. You can take things further using Nektar’s custom DAW integration software, which offers a much deeper level of control in Cubase, Logic, Reaper, Reason, Bitwig Studio, Nuendo and GarageBand. As well as giving you more in the way of DAW navigation functionality, this also enables you to access mixer pan and sends, automation, quick- or smart controls and more features directly from the hardware – with full parameter feedback on the T-Series display. What's more, the DAW Integration software lets you control your DAW’s built-in plugins - including patch browsing. In Reason’s Kong, for example, you get visual feedback on the drum pads when you’re programming a beat. Maps for many popular VST/AU plugins are included; they typically give access to two pages of controls, with Nektar calling them "standard maps". If you want complete control over your synth and instrument plugins, there’s the new Nektarine: Nektar’s plugin host software enables control of any VST 2.4, VST3 or AU instrument, again with full parameter feedback coming via the T-Series display. And the great thing is that it works independent of DAW integration. So, even if your DAW is not on the supported list, you can still use the T-Series' MCU mode for transport control and then load Nektarine for instant access to your instrument plugins. You can use the graphic editor to create or customise control maps for your favourite plugins easily (don’t worry - plenty of maps come supplied), and make them as deep as you like. Direct access buttons below the faders are screened with synth parameters such as OSC, Filter and LFO and make it easy to switch the function of the encoders as you’re working - always with clear parameter feedback on the display. With Nektarine, you can even load plugins directly from the keyboard. It also has a Patch Browser that lets you import your favourite patches, add tags as you go, and create your own patch library. A nice touch is that clicking on any patch will also load the instrument plugin it belongs to. The end result is a level of control that will remove the barrier between keyboard and software and make you feel like you’re using a hardware synth, so you can spend less time with your mouse and more time creating. You can even load patches and plugins directly from the keyboard. Of course, this kind of tight integration wouldn’t really mean much if the T-Series models didn’t have it in the performance stakes, but Nektar has ensured that there’s plenty here to please both players and programmers. The MK2 synth action keys are designed to deliver sensitive aftertouch, and the Key and Pad repeat options can be used to create repeating rhythmic phrases with adjustable accent, gate, interval and swing. And, while the pads are great for playing beats, you can also assign chords to them. The T-Series models tick all the boxes, then, offering creative performance features, a unique level of DAW control and super-tight integration with your instrument plugins. Find out more on the Nektar website.